What is the status of my company's disaster program? Click the "My Account / Order Status" link at the top right hand side of our site to check your order(s) status. 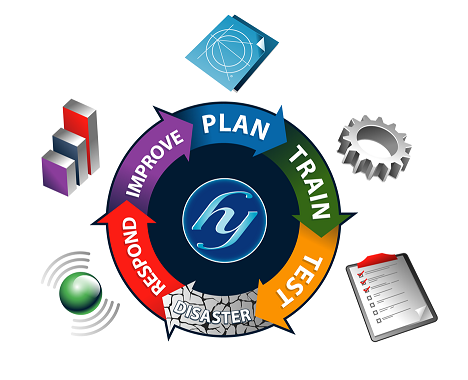 Your assigned Hytropy Emergency Manager and Business Continuity Officer will add notes as your program progresses so that you know the status of the program! Click the "My Account / Order Status" link at the top right hand side of our site to view orders you have placed. Then click the "Change quantities / cancel orders" link to find and edit your order. Please note that once an order has begun processing, or one of the questionnaires has been accessed, the order is no longer editable. Click the "My Account / Order Status" link at the top right hand side of our site to track your order. Your assigned Hytropy Emergency Manager and/or Business Continuity Officer will add notes as your program progresses so that you know the status of the program! When will my disaster program be finished? We construct your plans, then train your staff, exercise the program, then either retest the plan every six months, or, if disaster strikes, help you respond to it, and then later debrief with lessons-learned. We then incorporate them back into your program. Click the "My Account / Order Status" link at the top right hand side of our site to track your order status. If your orders each show a status of "delivered", please contact customer service for assistance at (225) 341-7598. An item is missing from my disaster documents. Click the "My Account / Order Status" link at the top right hand side of our site to track your order status. We will work very hard to ensure your program is complete and to your satisfaction. Please contact customer service for assistance (225) 341-7598. When will the emergency card be shipped? Click the "My Account / Order Status" link at the top right hand side of our site to track your order status. Once we complete the documents, train your staff, exercise it and submit it to the planners for final verification, we will send you your final card. Why does the emergency card have an expiration date? The reason we do this is because information on your planners is reviewed annually, and may need to be modified to remain effective. We also want to make sure that your disaster documents remain as good as the day they were minted, so we require an annual audit on your documents. Once that audit is successfully completed, we send you a brand new one!